These fat bomb recipes have all of the flavors of a gingerbread cookie with none of the carbs. The best part is they are low carb and ready in 10 minutes! I put molasses as optional because that is not usually something most people keep in their pantry. 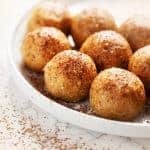 If you leave it out, the fat bombs might be a little less rich in gingerbread flavor but it will not be a significant difference.